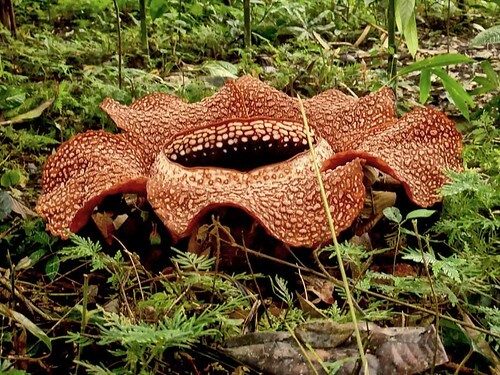 The Rafflesia is a huge flower that likes to have flies pollinate it. The way it gets the flies to pollinate it is its revolting smell of ROTTING MEAT! The normal place you’ll find a Rafflesia is on the rainforest floor. But don’t go near it, because as you have heard; it smells of rotting meat! Fruits come in different categories. The first category I’ll talk about, is the melon category. As you can see in this picture, the membrane is dividing it into segments. The last category I’ll talk about, is the tropical fruits category. although there are other categories of fruit like berries, pits and cores; I won’t go through them because then we’d all get bored. The name of my fruit is a Bliller. It has a tiled texture. The colour of my fruit is bluey-green. It tastes like an apple but it is sweeter. There is no skin to take off so you eat the skin. It is around 10cm long and 5cm wide. My made up fruit is a Banacado. It is half banana and half avocado. It looks like a banana but when you open it is green and it has a pip in the middle like an avocado. It tastes like an avocado mixed with butter. They grow on big trees and fall to the ground when they are ripe. My fruit is a type of mixed of colours. I think is every single colour in order. It is three centimetres tall and two centimetres wide. It has edible skin but tastes better without. My made up fruit is called a Puffer, Puffer Fruit. It grows in Puff grass. When you eat it, it just taste’s like air and then it Explodes! It looks like a rain bowed coloured pear. So those are the ideas from my visitors! Nicholas and Esther have some activities too. Did you know that a tomato is actually a fruit? Did you know that with the paw paw fruit, you used to have two trees to have male and female fruit, but now you only need one? Did you know that all the food that grows on plants above the ground, is a fruit? Did you know that all the food that grows underground, is a vegetable? Welcome to my “Fruits and Vegetables” page. First off, we’ll have a fruit list. Apple, banana, pear, grape, grapefruit, tangerine, mandarin, orange, kumquat, strawberry, raspberry, blackberry, blueberry, mulberry, lemon, lime, kiwi, dragon fruit, capsicum, tomato and all the other food that grows off plants, above the ground. Eggplant, celery, carrot, potato, beetroot, cabbage, lettuce, and all the other foods that grow on plants under ground. So, those are my fruit ‘n’ veg lists.